Authority of President or Patriarch. The power or right of deciding the Law, in dubious cases, or of interpreting, modifying, or amplifying, and occasionally of abrogating it, as vested in the Rabbis as its teachers and expounders. In Biblical times the Law was chiefly in charge of the priests and the Levites; and the high court of justice at Jerusalem, which formed the highest tribunal to decide grave and difficult questions, was also composed of priests and Levites (Deut. xvii. 9, 18; xxxi. 9; xxxiii. 10; Jer. xviii. 18; Mal. ii. 7; II Chron. xix. 8, 11; xxxi. 4). In the last two pre-Christian centuries and throughout the Talmudical times the Scribes ("Soferim"), also called "The Wise" ("Ḥakamim"), who claimed to have received the true interpretation of the Law as "the tradition of the Elders or Fathers" in direct line from Moses, the Prophets, and the men of the Great Synagogue (Abot i. 1; Josephus, "Ant." xiii. 10, § 6; 16, § 2; x. 4, § 1; "Contra Ap." i. 8; Matt. xv. 2), included people from all classes. They formed the courts of justice in every town as well as the high court of justice, the Sanhedrin, in Jerusalem, and to them was applied the law, Deut. xvii. 8-11, "Thou shalt come . . . unto the judge that shall be in those days, . . . and thou shalt do according to the sentence which they . . . shall show thee; . . . thou shalt not decline from the sentence which they shall show thee, to the right hand, nor to the left." This is explained thus: Whosoever the judge of those days may be, if he be recognized as competent and blameless, whether he be a Jephthah, a Jerubbaal, or a Samuel, he is, by virtue of his position as chief of the court of justice, invested with the same authority as Moses (Sifre, Deut. 153; R. H. 25ab). Even when they decide that left should be right, or right left, when they are mistaken or misled in their judgment, they must be obeyed (R. H. 25a). Heaven itself yields to the authority of the earthly court of justice as to the fixing of the calendar and the festival days (Yer. R. H. i. 57b; compare also Mak. 22b). The power of the Rabbis is a threefold one: (1) to amplify the Law either by prohibitory statutes for the prevention of transgressions ("gezerot") or by mandatory statutes for the improvement of the moral or religious life of the people ("taḳḳanot"), and by the introduction of new rites and customs ("minhagim"); (2) to expound the Law according to certain rules of hermeneutics, and thereby evolve new statutes as implied in the letter of the Law; and, finally, (3) to impart additional instruction based upon tradition. But the Rabbis were also empowered on critical occasions to abrogate or modify the Law (see Abrogation of Laws and Accommodation of the Law). In many instances where greater transgressions were to be prevented, or for the sake of the glory of God, or the honor of man, certain Mosaic laws were abrogated or temporarily dispensed with by the Rabbis (Mishnah Ber. ix. 5, 54a, 63a; Yoma 69a; compare also Yeb. 90b). In matrimonial matters the principle adopted is that, since marriages are, as a rule, contracted in accordance with the rabbinical statutes, the Rabbis have the right to annul any marriage which is not in conformity with their ruling (Yeb. 90b). In money matters the Rabbis claimed the same right of confiscation in cases when their ruling was disregarded as was exercised by Ezra (see Ezra x. 8; Giṭ. 36b). "No rabbinical court [bet din] can impose laws or institute forms of practise which the majority of people can not without great hardship accept and observe" ('Ab. Zarah 36a, B. B. 60b). "No rabbinical court can abrogate laws and institutions made by any other court, unless it is superior in both wisdom and number" ('Eduyyot i. 5). If, however, such a prohibitory law has been accepted by the entire Jewish people, no rabbinical court, even though superior to the one that introduced it, has the power of abrogating it ('Ab. Zarah 36b; Maimonides, "Yad," Mamrim, ii. 4). In case two rabbis, or two rabbinical courts, differ in their opinions, the rule is that in questions concerning Mosaic laws the more rigid decision should prevail; in questions concerning rabbinical laws the more lenient decision should be followed ('Ab. Zarah 7a). "After one of rabbinical authority has declared a thing to be unclean, no one else has the power to declare it clean; after one rabbinical authority has forbidden a thing, no other can permit it" (Baraita in Nid. 20b; Ber. 63b). If a teacher dissents from the decision of the highest court, he may state his dissent and teach accordingly; but he is not allowed to oppose the authority of the court in practise, in which case he falls under the category of a "zaḳen mamre" (a rebellious elder) (Deut. xvii. 12; 'Eduyyot v. 6; B. M. 59b; Yer. 'Ab. Zarah ii. 42d; Ber. 63a). As a matter of course, the Rabbinical Authority and legislative power rested with the entire body of the court of justice or rabbinical academy, and not with the president or patriarch only. Still, the more eminent the latter in knowledge and wisdom, the better he succeeded in making his opinion or propositions prevail in the deliberation; and so the newmeasure or institution was ascribed to him, or to him and his bet din (R. H. ii. 5-9, iv. 1-4; Yeb. 77a, and elsewhere). At any rate, the Nasi, or patriarch, announced the decision, proclaimed the New Moon, and represented on all official occasions the whole rabbinical body as its highest authority. The power of investing others with Rabbinical Authority was therefore presumably his exclusive privilege. It is known that from the beginning of the third century before the common era, rabbinical authorization by the patriarch consisted in the bestowal of authority and power ("reshut") to teach, to judge, and to grant permission regarding "the forbidden first-born among animals" ("yore yore, yadin yadin, yattir bekorot," Sanh. 5a). But it is obvious that this is no longer the original form of rabbinical authorization. 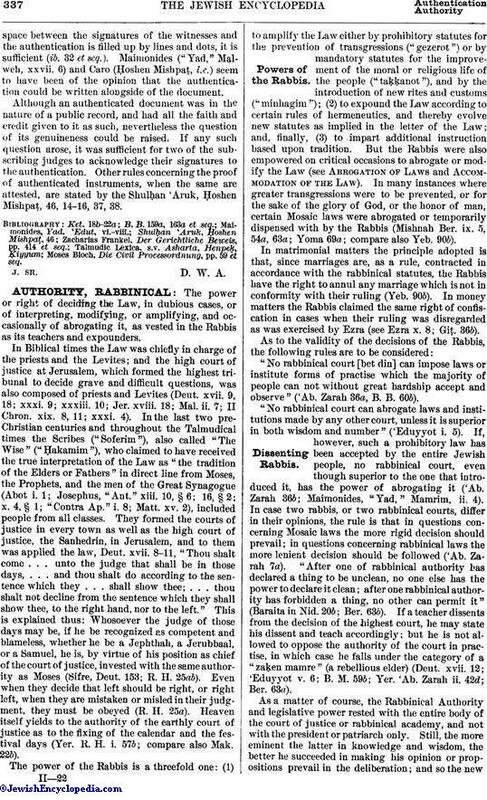 Far more significant and expressive of the idea of Rabbinical Authority are the words used by Jesus when ordaining Peter as chief apostle, or his disciples as his successors, and undoubtedly taken from pharisaic usage: "I will give unto thee the keys of the kingdom of heaven: and whatsoever thou shalt bind on earth shall be bound in heaven; and whatsoever thou shalt loose on earth shall be loosed in heaven" (Matt. xvi. 19, xviii. 18). This corresponds exactly with what Josephus, or rather his source, tells of the Pharisees in the time of Queen Alexandra: "They were the real administrators of the public affairs; they removed and readmitted whom they pleased; they bound and loosed [things] at their pleasure" ("B. J." i. 5, § 2). The terms "bind" and "loose" ("asar we-hittir"), employed by the Rabbis in their legal terminology, point indeed to a sort of supernatural power claimed by the Pharisees for their prohibitory or permissory decrees, probably because they could place both men and things under the ban, or "ḥerem." See Binding and Loosing. But there are other expressions which were presumably used in the old formula of rabbinical ordination. "Elijah," says Johanan ben Zakkai ('Eduy. viii. 7), "does not come to declare as clean or unclean and to separate or bring nigh." This was indeed a very important function at the time when the Levitical laws of purity and the questions of family or purity of blood ruled the entire social life of the Jews. Here the authority of the Pharisees made and unmade men and homes; and it is to this that Josephus (l.c.) possibly refers in saying, "They removed and readmitted whom they pleased." When with the Bar Kokba war the solemn act of ordination ceased, Rabbinical Authority changed its character also, inasmuch as the continuity of tradition was no longer its basis and safeguard. Hence the greater learning became the chief source of authority. Thus, for instance, Rab's authority was decisive in ritualistic questions and Samuel's in legal matters. From Abaye and Raba onward the latterday authorities were regarded as of greater weight than the earlier ones, because they could weigh all sides better. In the Middle Ages this attitude changed, from lack of self-confidence, and the respect for the former generation, which amounted to blind adoration, grew greatly (see Aḥaronim). In fact, the great lack of a central body representing Rabbinical Authority was felt more and more, and the attempts of Jacob Berab to reintroduce the ordination, or Semikah, failed. See Semikah. Thus Rabbinical Authority was transferred from the personality of the teachers to the codes of law, until finally the Shulḥan 'Aruk became its embodiment, while Jewish synods in various countries provided for temporary emergencies. 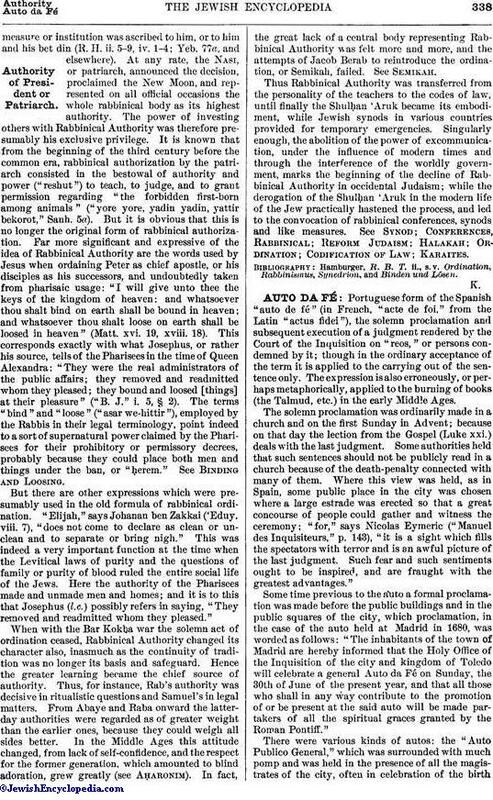 Singularly enough, the abolition of the power of excommunication, under the influence of modern times and through the interference of the worldly government, marks the beginning of the decline of Rabbinical Authority in occidental Judaism; while the derogation of the Shulḥan 'Aruk in the modern life of the Jew practically hastened the process, and led to the convocation of rabbinical conferences, synods and like measures. See Synod; Conferences, Rabbinical; Reform Judaism; Halakah; Ordination; Codification of Law; Karaites. Hamburger, R. B. T. ii., s.v. Ordination, Rabbinismus, Synedrion, and Binden und Lösen.